Book bloggers are wonderful at ferreting out books that haven’t made it onto the best seller lists and writing about them with enthusiasm. 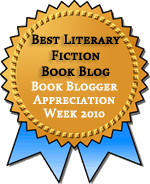 Today for Book Blogger Appreciation Week, we are joining other bloggers to recognize books that we’ve found on book blogs. These are books that we might not have considered, or might not even have known about, had other bloggers not recommended them. So now we are sharing some of those books, and the reviews that made them irresistible, with you. The Sweetness at the Bottom of the Pie by Alan Bradley: recommended at The Indextrious Reader and We Be Reading. We encourage you to check out these books and the blogs that brought them to us! I love this part of BBAW. :3 A great list of books and blogs! those are some great books. Love these lists.